The goodness* of brown bread, the great taste of white. Now there's a challenge! Well not any more. 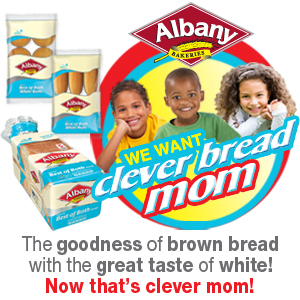 Albany Superior Best of Both WHITE bread combines the scrumptious taste of white bread with all the goodness* of Albany brown bread. *Albany Superior Best of Both WHITE bread is fortified as per legislated requirements and therefore contains added vitamins and minerals. It is high in carbohydrates, a good dietary energy source, low in fat as well as high in fibre which helps the digestive system work regularly. Albany Superior Best of Both is available as sliced bread, buns and rolls to give your kids more variety. Carbohydrates, proteins, essential fats, vitamins and minerals are all part of a balanced diet and a balanced diet can help to prevent lifestyle diseases such as high cholesterol, high blood pressure and diabetes, diseases that are sadly so prevalent in our fast food society. To ensure your children get all the nutrients in their diet, give them 5 fruits or vegetables each day together with carbohydrate based foods like Albany Superior Best of Both WHITE bread, protein sources like chicken or tuna and essential fat sources like nuts. Mix up the colours of fruits, nuts and vegetables to add variety and make certain that all the important nutrient groups and included in their diet. Instilling proper eating habits in your kids will help put them on the right dietary path for life. So fill those Albany Superior Best of Both buns, rolls and sandwiches with delicious sliced tomato, hummus, cheese, lettuce, cucumber, sprouts, peanut butter and sliced lean meats. Add a choice of fruits to the lunch box for dessert. Then encourage your kids to wash it all down with a glass of refreshing juice or water. Of course, from now on, your kids will have high expectations, they will want Superior lunch boxes everyday-Albany Superior lunch boxes.